Date & Time: Date in 2018 has not beeen announce yet! 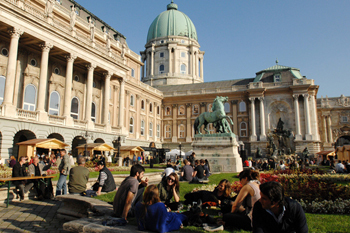 If you spend the Easter weekend in Budapest don’t miss the Easter Festival in Buda Castle. The terraces of the Royal Palace (the Hunyadi Court and the Bonfini Garden) will host a wide assortment of programs for all ages and interests over the 2-day spring holiday. Besides the programs, you can have your fill of traditional local dishes (including typical Easter meals: smoked ham, milk loaf, poultry, lamb, fish dishes) and drinks while enjoying the amazing panorama from the terraces of the castle. TIP: Tickets are valid to the exhibitions of the Budapest History Museum. 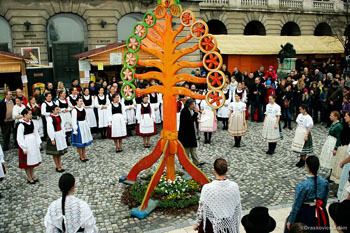 The guest of honour nation of the 4th Easter in Buda Castle Festival will be Székely Land (Székelyföld) from Transylvania introducing their unique Easter traditions, folk music and dances. An ancient ritual spring welcoming dance and procession, the inaugural ceremony of the Tree of Life (a symbolic tree adorned with colourful ceramic Easter eggs) by the Csillagszeműek Dance Ensemble and the Tündök Band (starts at 12.00), and a fun show by the Garabonciás Stilt Street Theatre will kick of the two-day merriments on the cobbled streets of the historic castle on Sunday, 27. March. Everyone will find a favourite among the many concerts (world music, folk, classical) and dance shows performed on the main stage in the Hunyadi court. Children especially have a wide palette of concerts to enjoy: Vilmos Gryllus at 11.00, Bea Palya at 15.00 on Sunday, or Kolompos concert and dance house at 11.00 on Monday. The concert of Misztrál Ensemble at 17.00 on Sunday promises to be a special treat to anyone who loves poem and folk song adaptations. Girls and women can count on to be sprinkled with soda water or a bit of cold water as customary in Hungary on Easter Monday (today men usually use perfume for the occasion while a few decades back they doused girls with a bucket of cold water). The practice is connected to ancient fertility rites and sprinkling also refers to the Christening ceremony and that the soldiers who’d guarded Jesus’ tomb poured cold water on the women bringing the news of the Resurrection. The day starts with a concert and dance house by the Kolompos Band at 11.00. The Folk Dance Gala starts at 12.00. At 13.30 kids can view a puppet show of Székely folk tales, followed by the Book of Forests performance by Aranyszamár Theatre at 15.00. Concerts by Márta Sebestyén and Judit Andrejszki at 16.00 and a concert by Ági Szalóki at 17.00 will close the festival. Since the 40-ay Lent is over give in to the temptations of show kitchens then wash down the delicious food with a glass of Hungarian wine on the Wine & Gastro Terraces in Hunyadi Court. Health conscious visitors will also find tasty bites at the booths offering healthy meals (bio, vegetarian, paleo). Yo can admire and have a taste of the giant Easter milk loaf of the festival. At the art and craft fair, gastronomy market you can pick up unique, quality souvenirs and gastro delicacies. Craft workshops – you can view the best craftsmen of the Carpathian basin in action: smith, egg shoer, egg painter, but you can learn the secrets of soap making, flower weaving, pairing healing herbs too. Besides the concerts mentioned above, the festival welcomes smaller and older children with a host of fun and exciting programs on both days. Costumed bunnies will treat them with small surprises and they can also hunt for Easter eggs. The Bonfini garden at the northern gate of the castle gives home to Bóbita Kikeleti Mesekert (Story Garden) and Komédiás Mező (Comedian Park) where kids can enjoy interactive plays, and puppet shows, try their hands at arts and crafts in the Easter craft workshops, get active in traditional folk games and plays: egg throwing and rolling. They can also have a ride in the buckets of the merry-go-round, go on an adventure in the labyrinth of the World Tree and pet animals in the small zoo (Mese Mezei állatsimogató). See also our other program recommendations for Easter in Budapest! Browse also our March program recommendations!